"Today we are inaugurating a work that many believed would never be completed," Prime Minister Alexis Tsipras on Tuesday said at the official inauguration of the Corinth-Patras highway, a 120-km section of the Olympia Highway. "It is an important work for Patras, the Peloponnese and Western Greece that would never have been completed if it wasn't for the difficult negotiations with contractors and construction companies," he underlined. The Athens-Patras trip will take 1h 40m after the completion of the work, which will create the prospects for further development in the wider region, he said. "We are opening the road that was hindering the connection of Western Greece with the capital, we are opening the road to exit the crisis and supervision," Tsipras stressed, adding that this is the strong symbolism of the work. "It is a day of joy for Western Greece and the message sent is that Greece can once again stand on its feet," he stated. Infrastructure and Transport Minister Christos Spirtzis, on his part, said that the long isolation of Patras, western Greece, Epirus and the Ionian islands was finally at an end. "The more than 10-year road blockade of Patras, the third-largest city of the country is finally ending. There is finally an end to the fear of an accident on a road that was literally drenched in blood all along its length. There is not a family in western Greece, Aitoloakarnania and Epirus that has not mourned the loss of loved one on this road," he said. Referring to the long delays that had dogged the project, which had started in 2007 and was only half finished in 2015 when SYRIZA came to power, he noted that the work had been bogged down by such an "incredibly tangled skein of obstacles, loose ends, problems and reactions" that it seemed unlikely to ever finish. There had been a collective government effort to deliver the projects on time and the government "will continue with works that are useful to our people, our society, for the healthy productive forces of the country," Spirtzis added. He noted that the project will be fully completed once a road toll system charging in relation to distance travelled is installed, lowering the cost of the tolls, and the Patras-Kalamata road is inaugurated. The Olympia Highway has a total length of 202 kilometres, from Elefsina to Corinth and then to Patras and the Patras bypass. The Corinth-Patras section inaugurated on Tuesday is 120 kilometres long, with two lanes and an emergency lane in both directions and 12 completed tunnels with a total length of 18 kilometres along its length. 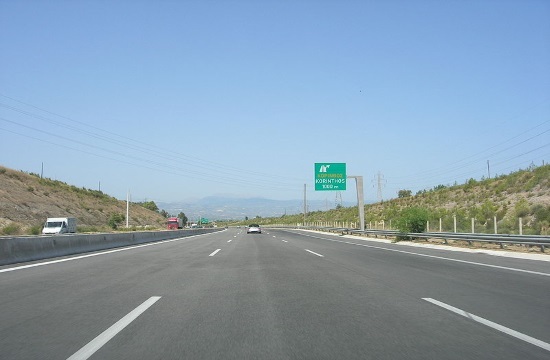 The contractor's obligations, in addition to building the Corinth-Patras highway, include the improvement of the existing Elefsina-Corinth section of the road and the Patras bypass, with a length of 82 kilometres. The total cost of construction is 1.8 billion euros and the cost of land expropriations is 223 million euros, or 172 million less than the amounts originally demanded by contractors before renegotiation.